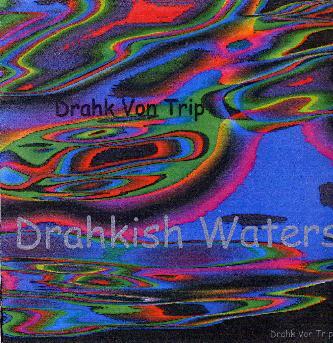 Drahk von Trip - "Drahkish Waters"
This limited edition CD-R features 3 jams from 2007 before the band basically broke up. They might be jamming again. I am not sure. Some of these folks have jammed with the Øresund Space Collective as well. Anyway, 3 long tracks, the shortest 17 and the longest 35 minutes! Dream Walk starts things off with some very spacey and repetitive lines with some violin to accent as things build up. Around 5 minutes Susanne starts to sing and Twodox plays some spacey synth sounds in the background. Göran plays some really cool drums and cymbal work as well. In the end this track was very dreamy but also very repetitive. Now the 35 min journey begins. Drakish Waters is a very cool jam. It has a mysterious feel to it and keeps you on the edge. Susanne plays some interesting flutes and later violin and the groove just slowly builds and builds, but this one always stays interesting and mesmerizing! This is perhaps one of the bands coolest pieces of music captured on a recording. Waiting- Hurry is 27 minutes and starts with everyone trying to figure out where to go but in an interesting start stop like fashion. Like the jazz folks would do. When it takes of it really has a killer groove that would make CAN or Circle jealous! The track comes down around 17 minutes and is very spacey and beautiful and some amazing cool guitar. Contact the band for your copy!